A new bug-fix release for Liferea 1.12 series was released today. 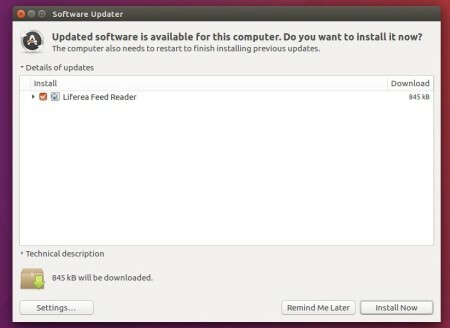 Here’s how to install it in Ubuntu 18.04, Ubuntu 16.04, and derivatives. This is a bugfix release. It includes an important bug fix that solves a possible endless loop on using “Next Unread” which several users experienced as endless high CPU usage. If you are affected by this: please upgrade! This release also switches the keyring integration from GnomeKeyring to libsecret and introduces a flatpak JSON. For Ubuntu 16.04, Ubuntu 18.04, Linux Mint 19, 18.x, the new release is available in the unofficial PPA repository. Type your password (no asterisks feedback while typing) when it prompts and hit Enter. Finally launch the news reader from your application launcher and enjoy! (Log out and log back if you don’t see the icon). As the PPA also contains many other software packages, you may remove it by launching Software & Updates and navigating to Other Software tab.